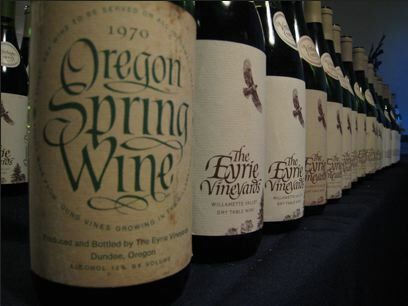 I was fortunate to be one of the 250 people who attended The Eyrie Vineyards Fiftieth Anniversary Vertical Tasting in Portland, Oregon, this past February 22, 2015, hosted by Diana and Jason Lett. This momentous event commemorated fifty years since David Lett planted the first Pinot Noir vines in the Willamette Valley of Oregon on February 22, 1965. I have been enthralled with the story of David Lett and wrote extensively about the first plantings of Willamette Valley Pinot Noir in a previous issue (“Oregon Pinot Noir: Who Planted First?”: www.princeofpinot.com/article/ 1090/). It was not surprising then that I could not contain my enthusiasm for this occasion that was enlivened by cherished memories, abundant applause, lively toasts and extraordinary wines. Speaking to an avid crowd of family, friends, customers, wine press, sommeliers, and winemakers from around the world, Diana Lett led off the festivities describing her first meeting with David Lett at a book publisher’s conference in the Midwest in 1965. 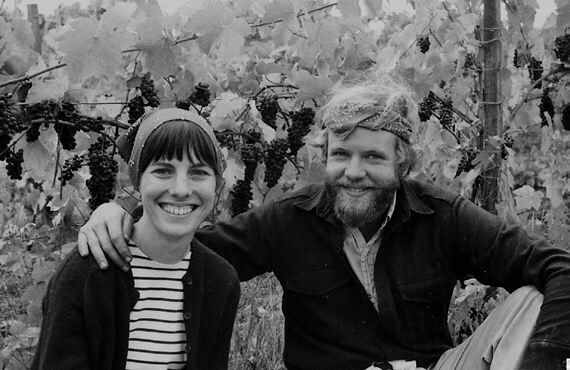 After David had planted his first Pinot Noir cuttings in early 1965, he sold college textbooks to support himself, and this had led to the couple’s fortuitous meeting. Three months after their chance meeting, they were married, and Diana found herself in a muddy field in the Dundee Hills in a yellow raincoat, helping David establish the first Eyrie vineyard. The remainder of the afternoon was orchestrated by Jason Lett, who provided his personal insight into the origins of The Eyrie Vineyards, the establishment of the vineyards and winery, the transition upon David’s passing in 2008, and the present challenges of the winery. Many treasured family photographs brightened the backdrop for the often humorous presentation. An extraordinary vertical tasting of The Eyrie Vineyards Pinot Gris, Chardonnay and Pinot Noir covering five decades was accompanied by Jason’s detailed insight about each wine. The celebration concluded with a clamorous sparkling toast with The Eyrie Vineyards Pinot Meunier Rosé Brut Nature, Eyrie’s first sparkling wine. A number of the treasured wines tasted were offered for sale, with all profits donated to support the Cascades Raptor Center of Eugene. David Lett grew up on a farm in Utah, graduated with a Bachelor of Science degree from the University of Utah in 1961, and was in San Francisco waiting to begin dental school when a road trip to Napa Valley wine country led to a life-changing epiphany. David visited Souverain Cellars, one of the few California wineries producing premium still dry wines at the time. He was so inspired by the founder and winemaker at Souverain, J. Leland “Lee” Stewart, he would later remark, “I turned winewards.” He was offered a job at the winery, but his parents encouraged him to seek more education instead, and he enrolled in a two-year enology and viticulture course at the University of California at Davis. When David was at Davis, he fell in love with Pinot Noir at a time in America when almost no one was familiar with the variety that was grown almost exclusively in the Burgundy region of northern France. Despite this, he was determined to pursue options for growing and producing Pinot Noir, and became convinced that the unique climate of Oregon’s Willamette Valley was potentially ideal for growing Pinot Noir. This determination was hatched despite the sentiment of the time that Oregon was not suitable for the successful cultivation of European wine grapes. After graduating from Davis in 1964, David traveled to northern Europe, including Burgundy, talking to vintners, winegrowers and viticulture professors about cool climate viticulture. 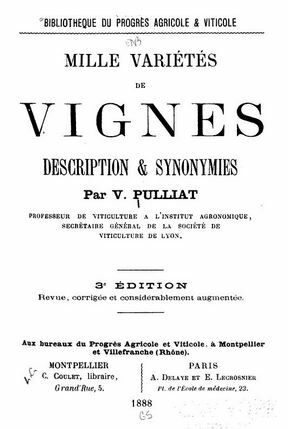 David’s hand written notes while at Davis indicate he had studied closely the writings in the 1800s of the French ampelographer, Victor Pulliat, who took his inspiration from Dr. Jules Guyot, a French physician and agronomist who is best known for his work in viticulture. Their writings revealed the important notion that wine grapes should be matched to climate. Undoubtedly, David’s thinking was also influenced by the research in this country by noted American viticulturist, Albert J. Winkler, Professor of Viticulture at Davis. Together with his student and later colleague, Maynard A. Amerine, who also became a professor at Davis, they devised a heat summation system for wine grapes. The number of “degree days” of sunshine an area received was quantified, allowing growers to determine which grape was best suited to a particular growing region. The scale, which categorized heat summations into five climate regions labeled Regions I (the coolest) through V (the warmest) for California was first published in 1944 as the Winkler Scale and updated in 1963, providing a standard directive for winegrowers in matching grape varieties to appropriate geographic areas. David realized that the varieties Pinot Noir, Pinot Gris, Pinot Meunier, Muscat Ottonel, true Pinot Blanc and Chardonnay were well suited to Region I (2,500 degree days or less) climate of the Willamette Valley The Valley had long been considered too cold and wet to grow wine grapes, but vineyards planted on slopes in the rain shadow of the Coast range provided Region 1 climes similar to the Cote d’Or. Rainfall was about 40” annually but it came almost solely during the winter, with little precipitation during the growing season. When David returned to the United States in late 1964 at the age of 25, he gathered 3,000 grape cuttings from certified vineyards in California, being careful to insure that the vines were as “clean” as possible. 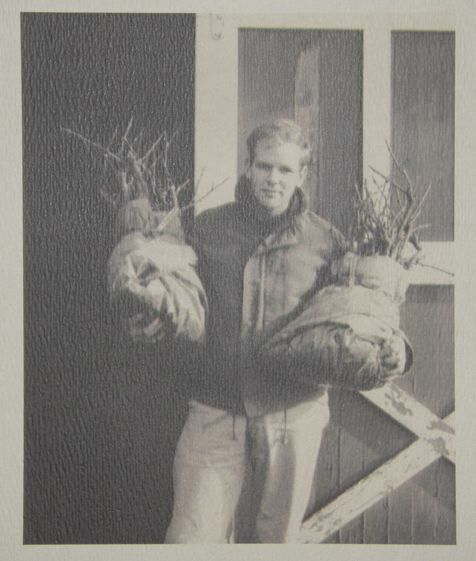 After traveling north to the Willamette Valley in February of the new year, he found a suitable site to lease and establish a nursery for his plantings just outside Corvallis on February 8, 1965. His personal journal indicated that he borrowed a tractor to plow nursery rows on February 13, noting in his journal, “Slowly I am learning to be a farmer. I hope I don’t lose all my cuttings while I’m waiting to get them in the ground and all my money while I am waiting for a job.” The historic photo below is from the personal collection of Diana Lett and copyright protected. 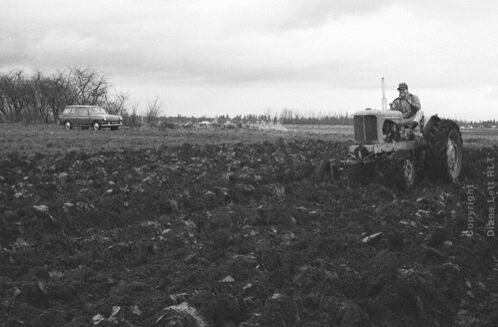 David started planting his cuttings in rows to root with his friend Jono Howe on February 22, 1965, the first plantings of Pinot Noir, Pinot Meunier and Chardonnay in the Willamette Valley, and the first Pinot Gris outside of Europe. More cuttings arrived from Davis and planting concluded about a month and a half later. Muscat Ottonel and Riesling were also planted according to David’s carefully annotated journal. After establishing his cuttings by the summer of 1966, and carefully studying soil surveys and maps, and climatological data from the Willamette Valley, David found an ideal vineyard site in the Red Hills of Dundee. The property was an abandoned prune orchard sited on a gentle 20-acre, south-facing slope, with Jory soils that retained food moisture during the summer. Field preparation and transplanting began in 1966 with the major planting consuming 1967. Inspired by the red-tailed hawks that made their nest (eyrie; EYE-ree) in the trees at the top of the vineyard site, David, along with his new spouse, Diana, christened their new vineyard and winery The Eyrie Vineyard. Jason joked that the name would not normally be an ideal choice for a winery since few people knew what an “eyrie” was, and fewer yet could spell or pronounce the name. The photo below shows the Letts at harvest 1970. 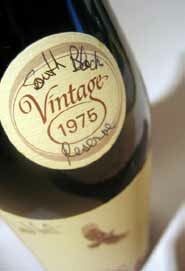 By their first vintage in 1970 (the first release of Pinot Noir was labeled “Oregon Spring Wine”), the Letts had established 8 acres, approximately half of which were Pinot Noir clones UCD 1A (Wädenswil) and UCD 18 (“Tout droit”). Pommard 5 would be added a few years later. The Pinot Gris cuttings, all 160 of them, came from Davis, and the Chardonnay from Jerry Draper’s Spring Mountain Vineyard in Napa Valley (previously called the “Draper Selection,” cuttings have been submitted to Davis and will be re-certified as the “Eyrie Clone” of Chardonnay). Today, 3.9 acres of the original 1966 plantings of Pinot Noir at The Eyrie Vineyard survive, making them the oldest Pinot Noir plantings in the Willamette Valley. 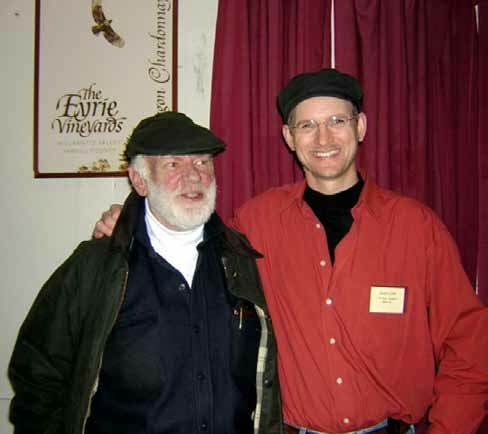 Charles Coury, who was a friend of David’s, is often mentioned in historical recollections of the first planting of Pinot Noir in the Willamette Valley. Accurate records including David’s personal journal indicate that Coury arrived later in 1965 than Lett, and rooted some of his own cuttings in David’s established nursery plot in the spring, before finding a suitable location for his vineyard, nursery and winery in Forest Grove. Coury planted his first vineyard at Charles Coury Vineyards in 1966, and some of his original Pinot Noir plantings still survive today. Inspired by Rachel Carson’s book, Silent Spring, published in 1962, that decried the use of pesticides in farming, the Letts practiced strict organic farming from the beginning, never treating the own-rooted, non-irrigated vines with insecticides, herbicides or systemic fungicides that were in widespread viticultural use in the 1960s. Eyrie’s commitment predated organic or biodynamic certification, but today, all 60 acres encompassing five Eyrie vineyards are organically certified. Vine age varies from the vines planted in 1965 to the newest plantings in 2015. Until the 1980s, David performed all the important vineyard and cellar work himself and he impressed visitors with his intimate knowledge of each individual vine. He was an innovator in the vineyard, practicing leaf pulling to limit yields and vertical trellising, viticulture techniques now widely used in cool climates. David honed his winemaking craft through a career spanning almost 40 commercial vintages, holding the distinction of producing a single vineyard Pinot Noir longer than any other winemaker in the United States at the time of his passing in October 2008 on the eve of harvest at the age of 69. He tried to pick early enough to retain what he considered the grape’s essential character, relying on de-stemming, and whole berry, small lot, proprietary yeast fermentations (only in the last decade has the transition to wild yeast fermentations occurred). 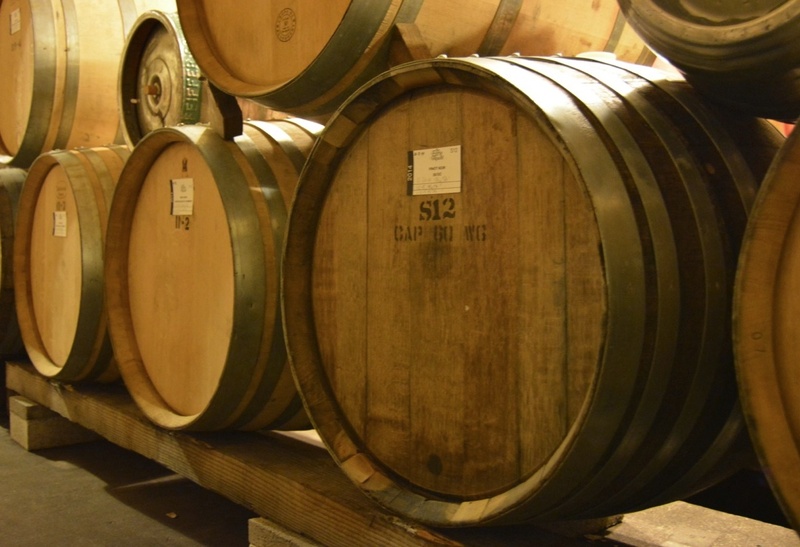 Aging was carried out primarily in neutral French oak barrels. 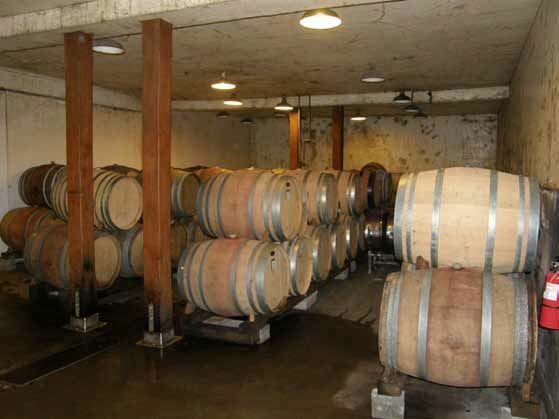 Twelve of the original barrels bought for the 1970 vintage are still in use today (see photo below) and only 15% of the barrels in the winery are under five vintages old. The Pinot Noirs were unfined and rarely filtered. The wines remained faithful to a consistent theme of classically styled Pinot Noir, avoiding trends toward extraction and higher alcohol, and instead seeking balance and fully evolved acidity that ensured age ability. The Letts set up a winery in a former food processing warehouse in McMinnville that had cement floors, heavily insulated walls, low ceilings, and ideal temperature and humidity for winemaking. They rented the original space for $25 a month, producing their first vintage in the functional but unglamorous facility. They intended to build a winery on their Dundee Hills estate and even had plans drawn up for it. The estimated cost of $22,000, which seems piddling today, was beyond their means, and no bank would lend them the money, so they adapted the warehouse. Although everything had to be done by hand or pump since it was not geared to forklifts, they found satisfaction in its simplicity, and soon bought the building for $11,000, never to move despite their intentions and the development of McMinnville all around them. The winery today remains essentially unchanged from its original configuration. Production at The Eyrie Vineyards has remained at 8,000 cases annually since 1985. This has been partly the result of intensive farming and the desire to put quality above all other considerations. Jason Lett is creating his own legacy at The Eyrie Vineyards since assuming the winemaking and vineyard management in 2005 despite the weight of preserving the winery’s revered historical significance. He has been faced with a number of challenges, three of which are highlighted in the following discussion. What do you do when you inherit a 6,000-case library of wine? In Jason’s mind, the challenge was clear once his early assessment indicated noteworthy bottle variation in the library. While Eyrie library wines had been stored in ideal conditions, it became apparent to Jason that there was bottle inconsistency, and he did not feel comfortable in showing or releasing the wines unless pre-oxidation (premox), cork taint and bottle variation could be dealt with. He found that 60% of the bottles were perfect, 30% showed premature oxidation, and 2-10% showed cork taint. David had accumulated a treasure chest of wines for several reasons. He believed the wines of the Willamette Valley would never realize true success and respect unless the wines showed age ability. In addition, when David found wines to his liking, he stashed them away with no intention of releasing them. Some wines were produced in experimental one-barrel lots, making them unlikely candidates for commercial release. Even when the Letts struggled financially in the early years of the winery, David put aside cases, and continued to do so throughout his career. He eventually amassed an incredible library representing the total output of all the varietals produced at Eyrie, a rarity among wineries in the New World. Jason established an ingenious 21-step process called Cellar Certification which is unrivaled in its thoroughness. He developed techniques and designed equipment that would allow each bottle in the library to be appraised, tested, and if pristine, repackaged to guarantee perfect consistency. The process led to extremely small amounts of residual oxygen in the new bottles. An incredible number of man hours was required over 10 years to refine the process. The first suite of Cellar Certified vintages was released in 2013, and Eyrie is proudly the only wine estate in the world using this certification process. Jason's goal, like his father's, is to help advance the reputation of the Willamette Valley as one of the world’s great regions. For the Cellar Certified wines and all wines produced since the 2008 vintage, Diam corks have been used and there has been no issues with cork taint or premox since. Jason believes that premox developed in earlier vintages of Eyrie wines from less dense corks, a discovery that needs to be further researched. All the wines tasted at this Fiftieth Anniversary Vertical Tasting were Cellar Certified wines. When David establishing his plantings in the Dundee Hills in 1966, he knew that the Phylloxera aphid was not present. He also knew of the potential for its destructive powers, but he chose to plant his vines on their own roots un-grafted, believing that the advantages outweighed the risks. Own-rooted vines have the advantage of being more drought and disease resistant, their trunks can be renewed easily, and many believe they produce better grapes. In the early 1970s, Oregon’s winegrowers imposed a strict quarantine to prevent the importation of tainted soil and most vineyards were planted own-rooted for decades. In 1990, the first case of Phylloxera was found in the Dundee Hills and the pest has quickly moved into and destroyed the vineyards surrounding Eyrie. Despite the avoidance of soil discing and tilling and other precautions, in 2005 the original vines at Eyrie succumbed by showing the first signs of weakening, and over the past ten years the areas of affected Pinot Noir and Pinot Gris vines have merged and enlarged. Rather than tear out the original vines, new acreage is being planted, viewed as an opportunity to trial different rootstocks and new grape varieties, including the Willamette Valley’s first planting of Trousseau Noir (2012), and the expansion of Melon de Bourgogne and Pinot Meunier plantings. 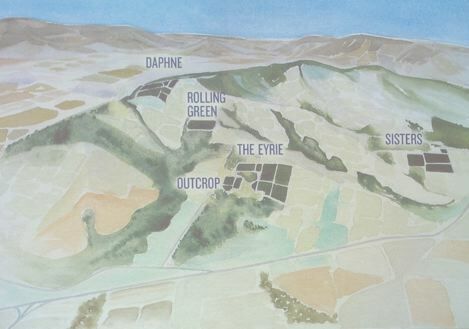 Eyrie currently owns an additional 55 acres of land suitable for additional vineyards. Healthy original vines are being identified to use as mother vines to graft and propagate, allowing the preservation of Eyrie’s genetic vine heritage for the future. McMinnville has developed around the winery, making it impossible to expand. The low ceilings provide an appealing atmosphere, but prevent efficient use of space and forklift assistance. The interior of the current winery is pictured below. Jason also feels there is import in vinifying wines close to the vines. These considerations have led Jason to design a building that would in theory allow him to make wines without the use of electricity or forklifts, yet enable him to use these modern assists if necessary. The winery would be constructed with hand- made wine in mind, drawing on the principles of ancient Roman and Burgundian cellars. The winery would be sited as David had planned, overlooking the original vines at The Eyrie Vineyards. There are very few, if any, Oregon wineries that can call on such a vast library of wines to conduct a vertical tasting of three varietals over five decades. Tasting older vintages in pristine condition is a unique opportunity few people, either critic or consumer, have the opportunity to experience. 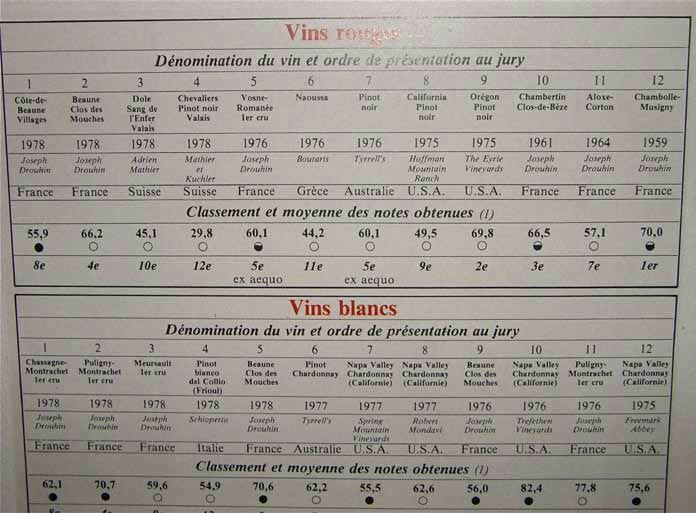 For old wines, it is not a matter of scores or comparative quality, but the realization that aged wine is unique in the secondary characters and surprises it offers. As noted wine writer Hugh Johnson remarked, “Young wines are exciting; old ones can be moving.” The wines in this vertical tasting are listed here with comments by Jason Lett regarding their vintages and production. I have made no attempt to tantalize you other than to make some general comments. I am trying to avoid displaying the smug attitude that I got to taste these but you didn’t. 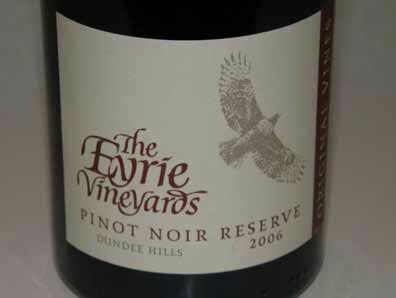 If you do get to taste any of these older Eyrie wines, and some are for sale from the winery, I encourage you to do so, for you can’t help admire their staying power and uniqueness. Modern drinkers of California Pinot Noir may find difficulty in getting their arms around these wines which are light in color, delicate, often acid-driven, with very subtle nuances. The wines also reflect their vintage origins more so than the case with California Pinot Noir which tends to be more consistent, even more reliable, yet more uniform from vintage to vintage. The Eyrie wines in this vertical tasting were remarkably fresh, highly pleasurable, and fascinating in their many permutations. The older Pinot Gris wines were particularly fascinating since we often think of Pinot Gris as most enjoyable when fresh and young, yet the older vintages tasted here offered an unusually complex array of enticing aromas and flavors. Picked October 17, Brix 23.2º, pH 3.26. Not for sale. From 4 rows of original plantings. Cool spring with set in early July. September gave twice the normal amount of rain with gradually cooling temperatures extending into October. · Pale golden orange color in the glass. Aromas of stewed apple, nuts, and caramel. Apple-driven flavors slightly faded with very bright acidity and a dry finish. Picked October 12, Brix 21.8, pH 3.43. Dry and relatively cool from April through June. Moderating temperatures in August and slightly warmer in September with 3 inches of rain in the third week. Cool until harvest. · Pale golden yellow color in the glass. Very delicate, with citrus, green apple and roasted nut highlights, finishing bright and clean. Picked October 29, Brix 23.5º, pH 3.60. 22 cases, never released. For sale. Protracted coolness in September and October captured all the flavor possible for this vintage. In David’s opinion, 1976 and 1975 were the best of the decade. Aged 3 years to soften tannins. · Light purple color with slight bricking of the rim of the glass. A delightful wine with considerable charm remaining, offering an elegant array of cherry, tobacco, tea and dried herb flavors framed by mild dry tannins, finishing with a bright, cherrydriven finish that lingers. Picked October 4, Brix 22.5º, pH 3.53. Not for sale. · Light purple color in the glass with slight bricking of the rim. A delightful aged wine with flavors of cherry, tobacco, tea and dried herbs. Admirable elegance with mild dry tannins and a thirst-quenching finish. Very pale salmon color in the glass. Delicious flavors of apple and pear, Incredibly alive and vibrant with perfect balance and some finishing power. Amazing! · Very pale salmon color in the glass. Delicious flavors of apple and pear, Incredibly alive and vibrant with perfect balance and some finishing power. Amazing! Picked November 5, Brix 18.4º, pH 3.50. For sale. Extremely cool year with a damp October. Miraculously, the grapes came into the winery warm and dry. 65% Eyrie vineyards. Chaptalized. · Golden orange color in the glass. Aromas of marzipan, sherry, nuts and vanilla wafer. Flavors of blood orange, lemon and lime framed by a good cut of acidity. Picked November 22, Brix 19.0º, pH 3.84. For sale. Not released previously. Perfect bloom, warm to hot summer, rain in last two weeks of September causing some panic. Grapes picked before and after the rains. The wine spent 18 additional months (30 months total) in barrel. Chaptalized a modest amount to get sugars up to 22.0º. · Light purple color in the glass. Aromas of purple grape and spice lead to rustic flavors of red and blue berries and red plum with an herbal vein in the background. Complimentary oak, modest tannins, and a sweet finish filled with fruit. Picked October 17, Brix 23.4º, pH 3.62. For sale. Late bloom with considerable rainfall in June. Warm summer with warmer than usual early October. Yields 0.8 tons per acre. · Moderately light purple color in the glass. Appealing scent of purple berries and spice. Demure but delicious flavors of sweet plum and berry, brewed tea and a touch of floral goodness. Well-structured with some finishing power. More pedigree than the Reserve. Picked October 10, Brix 22.6º, pH 3.31. For sale. Extended ripening season. 87% Estate. · Very pale salmon orange color in the glass. Very enticing perfume of tropical fruits, roasted nuts and caramel. Good attack and palate presence with flavors of citrus, pear and apple. Very fresh and vibrant with balancing acidity and a refreshing finish. Amazing! Picked October 9, Brix 21.0º, pH 3.44. For sale. A good growing season with rain at harvest. · Pale golden yellow color in the glass. Shy aromas of citrus and pear. More giving on the palate, with flavors of lemon curd, Asian pear and green apple framed by balanced tannins and acidity. A subtle vein of green herbs peeks out in the background. Picked September 30, Brix 23.8º, pH 3.50. For sale. Warm winter temperatures, late spring rains reduced grape crops by 50%. Quality was outstanding but quantity was limited. First vintage after college for Jason. · Light reddish purple color in the glass. Very floral perfume leading to flavors of cherry and plum. Still quite fresh and even a little tight, with balanced tannins and noticeable citrus-driven acidity. Picked September 24, Brix 23.2º, pH 3.44. For sale. Very cool weather in the season kept the crop relatively low, while a dry, hot summer put sugar levels higher than expected. Cooler temperatures and a small amount of rain right before harvest helped to tame the sugars and promote flavor ripeness. · Golden pink color in the glass. Inviting aromas of tropical fruits, grilled lemon and toasty nuts. Impressive freshness and balance with tasty flavors of pineapple, banana and citrus framed by lively acidity. Picked October 22, Brix 22.6º, pH 3.29. For sale. Perfect crop levels, warm and dry summer. One of the Willamette Valley’s finest vintages. · Pale golden yellow color in the glass. Bright aromas of lemon curd, creme brulee and Asian pear. Crisp and refreshing on the palate with vivid flavors of citrus fruits and a subtle thread of leafy herbs. Well-endowed with acidity, the wine’s finish is clean and thirstquenching. Picked September 14, Brix 20.1º, pH 3.50. For sale. Dry winter, wet spring, uneven grape set and modest yields of 1.5 tons per acre. Jason’s first vintage has the winemaker in charge at Eyrie. · Light purple color in the glass. Aromas of black cherry mash, herbs and tobacco. Mid weight flavors of black cherry, ripe strawberry and the faintest oak with a touch of herbs on the finish. A bit austere. Sorry Jason, but my least favorite Pinot Noir. Picked October 5, Brix 23.1º, pH 3.44. For sale. Moderate weather throughout the summer and fall. David’s final cuvée. He blended this wine shortly before he passed away, and it was re-barreled for a further 16 months before bottling in 2010. Atypically, this wine included some whole cluster inclusion. · Very light reddish purple color in the glass. Stem inclusion is evident in this wine with a leafy, herbal note on the nose and palate. Very smooth and silky, with a core of red cherry and strawberry flavors, picking up interest and intensity over time in the glass. Still young. Named after the three Pinot sisters: Pinot Noir, Pinot Gris and Pinot Meunier. 4 acres at 200’-360’. Planted in 1988-1989. · Light cherry red color in the glass. Scents of cherry and baking spice leading to an impressive attack and finish. Bright acidity, with a hint of herbs and plenty of tart cherries on the finish. Formerly the Eason Vineyard now owned by Eyrie, named after an outcrop of volcanic soil. 5 acres at 280’-360’. Planted in 1982-2002. Unknown clone, possibly Wädenswil 2A. · Light reddish purple color in the glass. Darker fruits are featured with a subtle smoky, iron undertone. Balanced tannins and easy to like now. 5.1 acres at 540'-720'. Planted in 1989. · Light reddish purple color in the glass. Welcoming perfume of fresh black cherry and savory herbs. Delicious mid weight black cherry core framed by healthy tannins and lively acidity. Amazingly generous and long finish. A special wine. Named after friends. 1.5 acres of Pinot Noir at 820’-860’, one of the highest vineyards in the Dundee Hills. Planted in 1974. Produced in 2001, 2008 and 2009 and 2012 vintages. · Moderately dark reddish purple color in the glass. Complex nose featuring aromas of black cherry, Herbs de Provence, spice and iron. Intensely fruity featuring a core of sweet blackberry fruit accented by earth and minerals, and a bold finish. 7 acres at 260’-410’. Planted between 1965 and 1985. Wines produced from these vines were labeled Reserve until 2005 when the name was changed to Original Vines. · Moderate reddish purple color in the glass. Very savory, with considerable dried herbs and tobacco notes accented with core of cherry fruit. Juicy with modest tannins and noticeable finishing length. Needs several years in the cellar. Pinot Meunier Rosé Brut Nature Eyrie’s first sparkling wine and the first sparkling Pinot Meunier Brut Nature produced in Oregon. This was created specifically for this occasion, but the process of creating this wine began 6 years ago. In 2009, the highest elevation Pinot Meunier grapes were picked and pressed to provide the founding base wine for the cuvée. The base wine aged 3 years in neutral barrel and became 40% of the final cuvée. The 2009 was augmented with 60% 2011 Pinot Meunier, also aged in barrel. Tirage was performed in January 2013, and the wine was aged in bottle for two more years before disgorgement in January 2015. No sugar was added, thus the name “Brut Nature” or non-dosage style. This wine is “cutting edge” in that Champagne that is drier than brut or sugar free is becoming more popular among consumers and more Champagne producers are reducing or eliminating the small amount of sugar, called le dosage added to the Champagne before the wine is closed with a cork. These trendy wines go by various names including non-dosé, ultra brut, zéro dosage, brut nature and brut zéro. To make this type of sparkling wine you must have a credible base wine, since you can’t hide flaws behind the dosage. By the time this wine was poured, everyone present had had plenty to drink and the sparkling wine was toasted with over and over until the glass was empty. No comments about the wine were recorded or are necessary except to say it had an appealing light pink color, tasted of fresh strawberries and raspberries, and was a fitting way to end one helluva celebration. Visit the website at www.eyrievineyards.com for more information and to buy current releases from the 2010, 2011, 2012 and 2013 vintages. Inquire about library wines. Wine Club members receive a 15% discount on current releases and $20 off library wine purchases. The Eyrie Vineyards tasting room in McMinnville is open daily, 12:00-5:00. Rotating library wines are available for tasting. The 29th Annual International Pinot Noir Celebration (IPNC) will be held July 24-26 on the bucolic campus of Linfield College in McMinnville, Oregon. Every year, over 700 pinotphiles from all over the world converge to revel in their beloved indulgence. No homework or written tests, and no dreadful lectures at 8:00 A.M. in the morning. Just an abundance of great Pinot Noir offered by 70 of the world’s greatest Pinot Noir producers, paired with the delicious farm-to-table bounty of Oregon prepared by more than 60 of the Pacific Northwest’s most talented chefs, and plenty of joie de vivre. The 3-day weekend experience includes tastings, seminars, vineyard tours, and alfresco meals, all presented in a relaxing and festive atmosphere. IPNC really knows how to throw a great party! This year the celebration focuses not only on Pinot Noir, but Champagne and sparkling wines from across the globe. 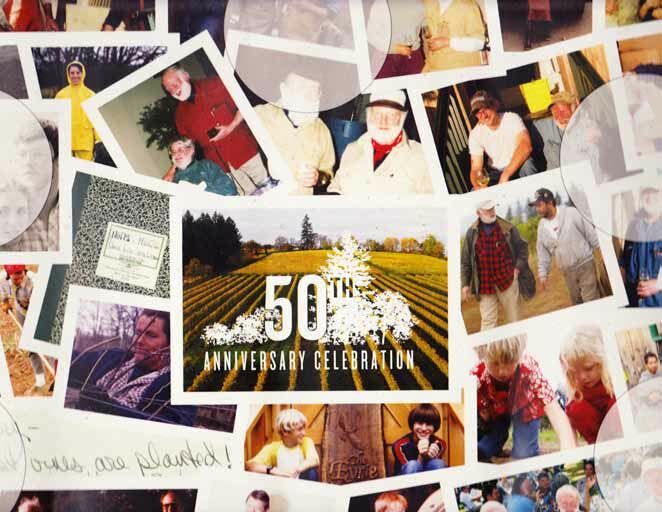 This is only fitting, as the Willamette Valley celebrates 50 years of growing Pinot Noir. The event will begin at the Grand Seminar, where attendees will learn how sparkling wines are made and taste a Champagne flight of three single-varietal bottlings, crafted from Pinot Noir, Pinot Meunier and Chardonnay. A “dosage trial” will follow, leading to an understanding of how this step transforms texture, balance, and the final expression of the wine. After that, enjoy an array of bubbles as you listen to the producers who made the wines. 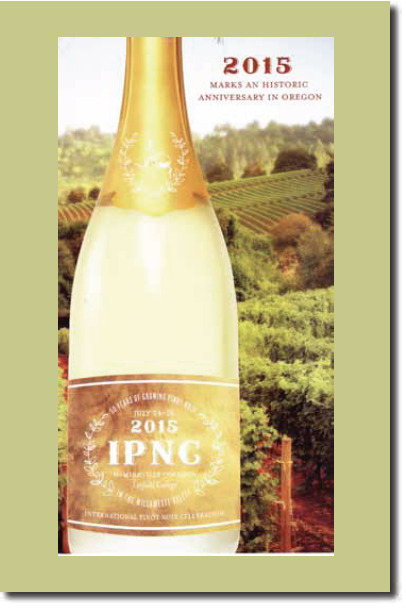 Lastly, raise a glass filled with a surprise wine, only to be unveiled at the IPNC, to toast the 50 years of growing Pinot Noir in the Willamette Valley. There will be plenty of Pinot Noir as well and winemakers featured in engaging seminars among an array of “classes” as part of the “University of Pinot.” Visit www.ipnc.org to confirm your place at the celebration.